With a haunting voice, affecting lyrics, and a minimalist take on production, Mothica creates a world that’s hard to not be drawn into. A new face in gloom ­pop, Mothica has collaborated with the likes of Tennyson, Diversa, Elénne, Brockhampton’s Bearface, and Kevin Abstract. Pigeons & Planes called her debut EP Mythic “a mix of tenderness and funereal tones drifting throughout its autumnal sounds, grounding it with a sincerity that speaks to the nature of often unexplainable emotions.” After Mythic, she transitioned into working with electronic producers including Pusher, Said The Sky, and Vindata. 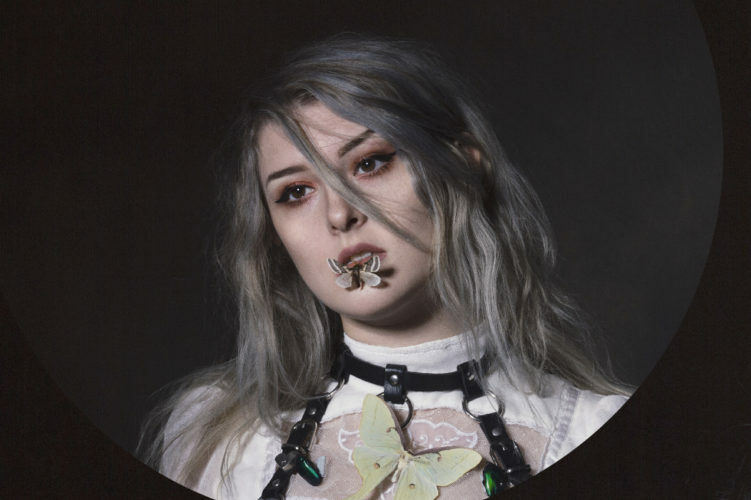 In 2017, Mothica released her Heavy Heart, an EP which featured compelling songs such as “Self Destructive,” “Mark My Words,” and “Sometimes.” In this interview, we sat down with her to talk about her new sample pack, creating foley out of fire, how she gets her haunting vocal sound, and more. Let’s start from the beginning – how did you get into producing and writing your own tracks? What resources were you using to learn when you were just starting out? In high school, I wrote on guitar and piano and recorded it as a voice memo with no metronome. Once I started college in New York and was introduced to SoundCloud, I started dabbling with electronic sounds in Garageband. Eventually, I was gifted a synth and downloaded Ableton. I took notes of what other producers were doing on the rare occasions I was in the same room as them. I never watched tutorials – I just wrote down what other people did because they had tips and tricks figured out, and much more experience than me. Take us into your creative space. What DAW do you primarily work in? What does your studio look like? I work in Ableton simply because it’s the first DAW I downloaded. I use Yamaha HS-7s, an Apollo, and a simple MIDI keyboard. I mostly use Omnisphere and Sylenth for my sounds. I have cut-out comments from SoundCloud behind my studio to boost my spirits, colored lighting, and lots of rugs. How do you create your signature vocal sound? Do you have a preferred microphone of choice? I’ve used the same microphone for five years – a Rode Nt-1. My dream microphone is the Telefunken AK-47, which I’ve recorded with for a few songs: “Out Of It,” “Self-Destructive,” “Cheap Tricks,” and “Up In Flames.” When I’m mixing my own vocals, I use the CLA-Vocals Plugin, Valhalla Reverb, EQ-8, and Ableton’s Precise Compressor. I love a mix of dry main and double reverb on my voice but delay (other than for one-shots) really bothers me. I never use autotune on my main vocal take, but I’ll autotune the harmonies so they sit nicely in the track. I used to only write harmonies by muting the vocals and singing in the same key, but now that I’ve been doing it a bit longer, I can write harmonies with the vocal playing. Walk us through what a typical project file looks like. Are there any plugins, sounds, or instruments that you swear by while creating music? I start most songs with the bassline. It’s the best way for me to feel the emotion of the track. I like to write over a bassline and add some other pads or synths from Omnisphere, Blue, or Sylenth that give it more of a personality, instead of leaving it completely bare. Whatever I’m writing the lyrics about, I want the production to match. For example, in “Crossfire,” I chose a whip sample after the first chorus to give it that Western feel. Omnisphere is super inspiring for writing songs, but more than anything, analog instruments are always what I gravitate towards. My song “Intro/Hand Grenade” is only made up of 8 tracks! We’d love to learn about your writing process – be it physical or emotional, what kind of space do you need in order to write? I’m the most productive when I’m angry or bitter about something. That fiery passion can fuel so many songs. I keep a lot of colored lights in my studio, which I change depending on the song. I almost exclusively write lyrics to songs outdoors, playing the track in my headphones, with the bustle of New York in the background. I used to walk around in circles until I got the melodies right, and I need some sort of white noise happening to give me a sense of privacy. My challenge this year is to write in any situation, because you never know what kind of studio you’re going to be in, whether it’s a bedroom or something more professional. While you’ve produced a slew of your own tracks, you’ve also worked with the likes of Pusher, Tennyson, Vindata, and more. What does your collaborative process look like? Do you prefer to work in a studio together, or send ideas back and forth with collaborators? All of the producers you mentioned were virtual collaborations. They sent me the tracks, and I recorded vocals on my own. I definitely prefer to be in the studio together, especially if it’s for my solo music. Someone can be an incredible producer, but if we don’t get along, and I don’t feel I can open myself up to them, then we probably won’t make anything worth releasing. Because I have some experience producing my own music, I like to work with people that take my suggestions but trust their own creative instinct. Tell us about creating your sample pack. It’s a diverse collection of everything spanning lush vocal harmonies, versatile percussion, piano warbles, and everything in between. How did the process feel different from writing your own songs? For this sample pack, I wanted it to be conceptually related to the EP, Ashes. Fire sounds! So, I invited some friends over and we literally set things on fire, including a microphone. We recorded the sound of lighter flicks, wood burning, extinguishing flames, matches, etc. I know people would expect a vocal pack from me, but I wanted this to be related to the music, and I hope people enjoy the cinematic nature of the samples. Being an artist in today’s music industry can be taxing. What has gotten you through creative or personal hardships while pursuing music? Honestly, I’m quite an emotional person so I just never run out of things to write about. I think about quitting music a lot for the sake of keeping it sacred. It started out as a hobby and it’s become so much more, and when I catch myself writing music for department store commercials to make money, it really does feel like my soul is being crushed. I love talking to other artists about their branding, direction, and writers blocks, and one day I hope to make a career out of helping others. It’s hard to take your own advice. Overall, it comes down to sharing your story and why you think it’s important. What have you learned, what have you gone through, and why should other people care? I’ve experienced a lot of darkness and I think it’s incredibly important to be honest so that I can reach others. I truly feel like the people that listen to my music are my kindred spirits. Lose yourself in the mesmerizing sounds of Mothica’s “ASHES” sample pack.